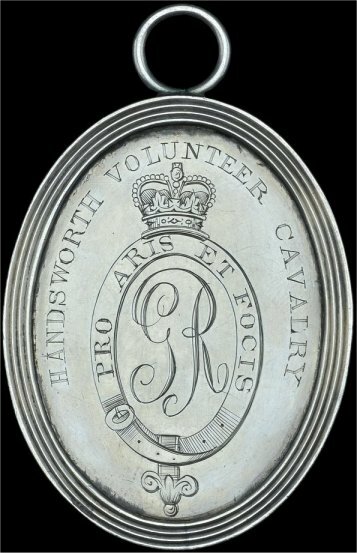 In Staffordshire no volunteer units of cavalry or infantry, other than the county yeomanry, were formed with the legislation of 1794. 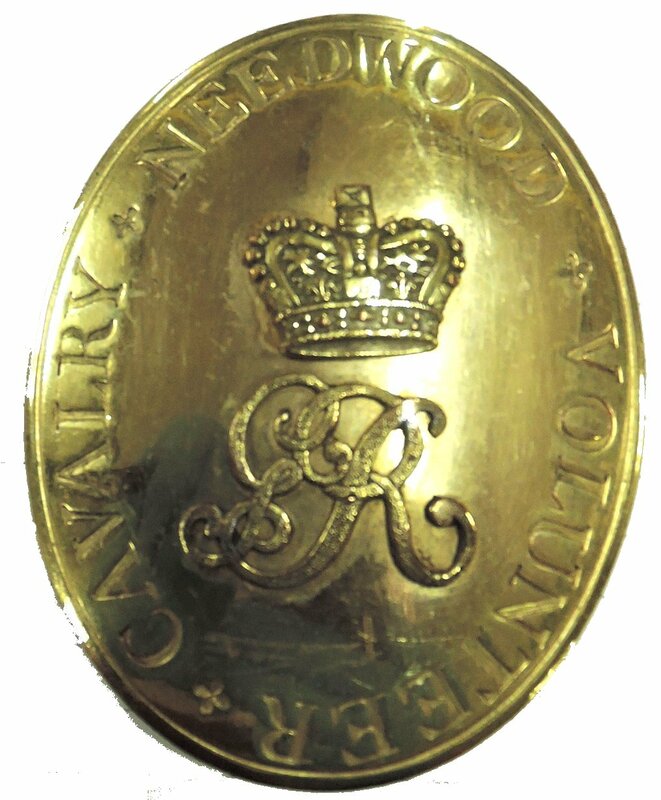 All independent Staffordshire cavalry volunteers raised in the 1790’s were formed at the time of the armed association enthusiasm of 1798, with one troop, Uttoxeter, raised with the second wave of volunteering in 1803. On this page are notes on the organisational basics, and dress and equipage where known, of the armed association and independent yeomanry cavalry of Bilston, Handsworth, Needwood, the Potteries, Stafford, Stone & Eccleshall, Tamworth, Uttoxeter, Walsall and Wolverhampton. Some of these belonged to associations that also included companies of infantry, which are examined on a separate page. Earliest dates of commissions, as best known to me, are taken from the War Office list of 1799 (sixth edition) or from the London Gazette. Not surprisingly, information on dress and equipment is sparse, and often limited to brief descriptions; in too many cases I have been unable to find even that. Willson’s chart of 1806 indicates that by that point all but one of those independent troops that still survived or had been reformed in 1803 were probably uniformed as for the county yeomanry, but that is not necessarily an indication of what was worn during the 1798-1802 formation. If new information arrives it will be added. Click all images to enlarge. Associated with the Infantry of the Bilston Loyal Association. Earliest commissions dated June 18 1798. One troop. Captain Thomas Loxdale. In October 1798 advertised for a trumpeter. Disbanded in or by 1802. Reformed as an independent troop with new commissions in December 1803, shortly afterwards becoming a regimental troop of the Staffordshire Yeomanry. Shown by Willson previous to 1806 as in red, faced yellow, officer’s lace red (meaning none? ), and breeches white, apparently then uniformed as the Staffordshire Yeomanry. Formed as an armed association, though a corps of associated infantry appears not to have been raised in 1798 as intended. Earliest commissions dated June 24 1798. One troop. Captain Nathaniel Gooding Clarke. Appears to have had a continuous existence as an independent troop until disbandment in the 1820’s. An early drawing by John Phillp at the Birmingham Museum & Art Gallery (shown at the Matthew Boulton exhibition in 2009) shows Tarleton helmets with tall feathers, breeches and boots, but no other details. Shown by Willson previous to 1806 as in red, faced yellow, officer’s lace red (meaning none? ), and breeches white, so possibly then uniformed as the Staffordshire Yeomanry. An engraved silver medal, dated 1802, was sold “as viewed” by DNW in May 2016. The obverse shows the Royal cipher within a crowned garter inscribed “Pro Aris et Focis”. If genuine, this might conceivably represent the design of the troop’s belt plate or helmet badge. Served as yeomanry. Earliest commissions dated 6 June 1798. One troop. Captain Richard Meek. Disbanded in or by 1802 and not reformed. No associated infantry. A belt plate kept by Birmingham Museums is of polished brass with the unit title stamped around the edge and a separate crown and cipher applied at the centre. Formed as an armed association with the infantry of the Loyal Pottery Volunteers. Earliest commissions dated May 21 1798. One troop. Captain Josiah Spode. Also listed (incorrectly?) as “Royal Pottery”. Appears to have become a regimental troop of the Staffordshire Yeomanry in 1803, disbanding shortly afterwards. That the distinction betwixt the officers & privates be determined by the respective committees, who are to procure Patterns of the Uniforms, and direct the Manner in which they are to be made. Notes: jackets may have been of the older type, without lace on the front, opening to show the waistcoat. No details of the trim of the Tarleton helmet are given. Though at first apparently linked with the infantry of the Stone Volunteer Association, served as yeomanry. Earliest commissions dated 6 June 1798. One troop. Captain George Steedman. Maintained an existence as an independent troop until 1813 when it became a regimental troop of the Staffordshire Yeomanry, shortly afterwards disbanding. Shown by Willson previous to 1806 as in red, faced black, officer’s lace gold, and breeches white. A black and white photo of a framed guidon is probably from an unidentified auction catalogue of the 1970’s or 80’s. The brief description shows that the flag is 33 inches in length, with a white field with an embroidered design heightened in sequins, fringed edges (barely visible in the photo and presumably gold), and cords and bullion tassels. A few areas of embroidery are clearly missing. Two ornate corner cartouches, partly floral, enclose “Stone & Eccleshall” in a ribbon above “V.C”; the other two, with more elaborate floral borders, contain sprays of flowers (roses and thistles?) tied at the base by a bow. 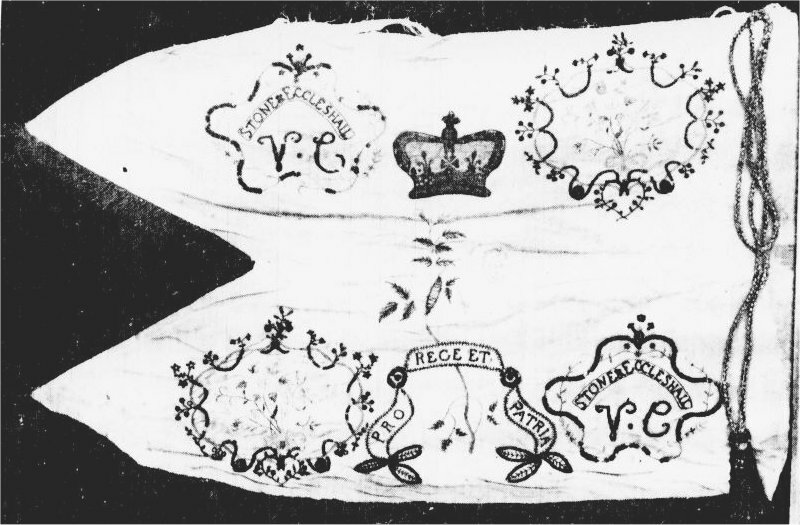 At the centre, between the crown and the motto “Pro Rege et Patria”, are the remains of larger floral sprigs, though only the stem of the left sprig appears intact. If there were only two sprigs, these would have borne a rose and a thistle, which would date the flag to the pre-1801 period. This guidon is very much in the “embroidered by the ladies” style; I do not know where it is now. Formed as an armed association. Earliest commissions dated July 6 1798. One troop. Captain Thomas B Paget. Linked with the infantry of the Association. Maintained an existence as an independent troop until 1813 when it became a regimental troop of the Staffordshire Yeomanry. A standard presented on 26 June 1799. Shown by Willson previous to 1806 as in red, faced yellow, officer’s lace red (meaning none? ), and breeches white, so possibly then uniformed as the Staffordshire Yeomanry. Shown by Willson previous to 1806 as in red, faced yellow, no officer’s lace, and breeches white, so possibly then uniformed as the Staffordshire Yeomanry. Though at first apparently linked with the infantry of the Walsall Loyal Volunteer Association, served as yeomanry. Earliest commissions dated 31 May 1798. One troop. Captain John Scott. Disbanded in 1802, and not to be confused with the Walsall troop of the Staffordshire Yeomanry, which had a continuous existence from 1794. Single standard presented on 23 September 1799. [Aris’s Birmingham Gazette, June 11 1798. Swinney’s Birmingham Chronicle September 26 1799. Thomas Pearce, The History and Directory of Walsall …, Birmingham, 1813. Frederic W Willmore, A History of Walsall …, Walsall, 1887. Two troops. Linked with the infantry of the Wolverhampton Loyal Volunteer Association. Commissions for the Wolverhampton troop in the London Gazette of 19 June 1798, though no dates are given in the War Office list of 1799. First meeting of the Tettenhall troop 28 June 1798. Captain George Molineux (Wolverhampton), Captain Francis Edward Holyoake or Hollyoake (Tettenhall). The Tettenhall troop and its officers do not appear in the 1799 War Office lists; recruited across seven outlying parishes, it seems to have maintained a distinct identity, but the two troops appear to have been uniformly dressed. Disbanded 1802. A new troop was offered in 1803 but not accepted “from some delay or irregularity”. The “Memoranda Book” of Henry Jesson of the Wolverhampton troop mentions purchases of pistol holsters and a “common sword for exercise”, and in February and June 1799 of “best” and “second” jackets. The tailor’s prices for making the jackets suggests that the second or undress jacket was not significantly ornamented. In the papers of the late R J Smith are notes by Leslie Buckell on an unidentified naive portrait and a miniature, both of Corbet Howard of the Tettenhall troop, with a black and white photo of the latter; this was once in the keeping of the Army Museums Ogilby Trust, but cannot now be traced. The portrait is said to show a scarlet jacket laced in gold with black collar and cuffs edged in gold lace, a Tarleton helmet with gilt metal and white plume, the label on one side reading “WOLVER[HAMPTON]”, white breeches and black boots. The miniature is said to confirm the black collar; here the lace is noted as silver, but the evidence for gold in the other painting seems clear. The collar is edged in narrow gold lace with a second line of lace or cord inside this, with small eyes at the two front corners. The jacket is laced across the front, but without loops or eyes at the outer buttons; fifteen rows of ball buttons are visible, suggesting twenty or more on the full length. The gilt(?) shoulder chains are on a dark ground. I have found no reference to Howard being commissioned; it may be that all ranks wore gold lace. 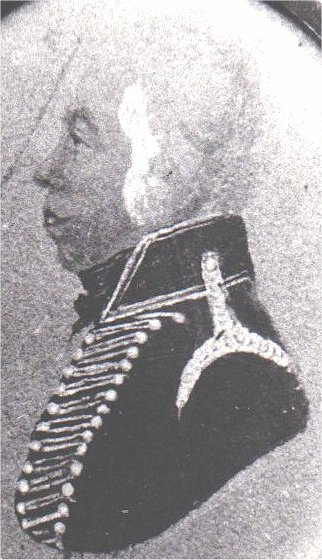 In the Ogilby Trust booklet by Smith and Coogan on the Staffordshire Yeomanry, Buckell’s colour notes are not taken into account, and for no apparent reason the black and white image is interpreted as showing a blue jacket with black facings and silver lace. This unlikely colour scheme is also, unfortunately, shown on the cover illustration, but the scarlet (or red? ), black and gold seem to me to be well sourced, and, for what it may be worth, match the colours of the Stone & Eccleshall Cavalry.